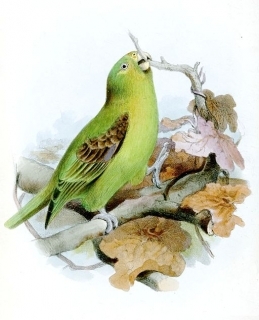 Parrotlets were kept in a French menagerie as long ago as 1682. Male-green/yellow in general; area around lores and eyes green/yellow; black/brown bend of wing; brown scapulars, lesser wing coverts and inner median wing coverts with white spotting; dull orange on outer two median wing coverts; dark brown secondaries and secondary coverts; green underwing coverts; uppertail green with red /brown margins on inner webs of lateral feathers; undertail olive/yellow. Bill olive/yellow with grey at base. Eye yellow/brown. Female-green upperwing coverts with exposed black bases to feathers; brighter yellow lores and forecheeks; brown primary coverts widely edged with green. Calls made in flight are harsh and high-pitched, or raspy. Not usually seen in captivity. House in tall enclosure with many plantings for hiding, minimum temperature 20C (68 F). Fruits such as: apple, pear, banana, orange, cactus fruits, mangos, papaya; berries such as: pyracantha, mountain ash, elder; lory nectar; vegetables such as: carrots, celery, green beans and peas in the pod; green leaves such as: Swiss chard, lettuce, kale, dandelion, chickweed; half-ripened seeds; sprouted millet, canary grass seed, oats, barley and a little sunflower; vitamin and mineral supplements; complete kibble for small parrots if taken. This species is rare and declining due to continuing deforestation for illegal crops and human settlement, particularly in Colombia. C Colombia, on western slopes of Cordillera Central in Cauca, western slopes of Cordillera Oriental in Cundinamarca, Sierra de la Macarena in Meta and possibly E Narino and eastern slopes of Andes in E Ecuador to N Peru. Found from 350-2300m (1148-7544 ft) in tall humid subtropical forest; also reports from savanna-like woodland and stunted ridge-top growth. Feeds on fruit and seeds, including mistletoe; may feed on maize crops and sometimes in Ficus and Clusia trees. Little known; it is thought that this species moves in response to food availability. Usually seen in groups of up to 10 individuals, with larger flocks where food abundant. Is quiet and easily overlooked while resting or feeding in dense foliage.